Tyler Perry's Diary of Madea's Family Reunion is the latest series of movies by Tyler Perry who also happens to star in this offbeat Comedy/Romance & Drama film which focuses a matriarch of an all American family who has been given a court order to foster a runaway. 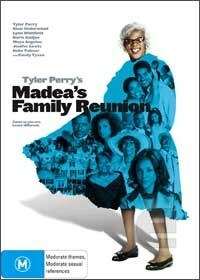 As with all of Tyler Perry's movies, various plots are happening with the main storyline such as Madea's nieces Lisa and Vanessa who are suffering relationship problems and thanks to a family reunion, the matriarch of the family manages to give her words of wisdom to her family before it all falls apart. These plots never really meet and fall apart from poor story telling. Comedy and drama is the formula behind this movie which unfortunately fails to hit the mark as the movie has difficulty in distinguishing between the two genres. Another DVD a telemovie!